Facebook plans to launch a self-contained VR headset priced at just US$200, according to an insider report published by Bloomberg. The wireless device's capabilities and pricing will revolutionise the VR headset market, just like Apple lit the touchpaper of the smartphone market with its first iPhone, reckons the business news specialist. The new self-contained Oculus branded VR HMD from Facebook will bridge the gap that currently exists between cheap headsets that use your smartphone for the display and processing, and expensive ones which rely on your PC/console for processing power. It is hoped that this will provide a best of both worlds option, hit a sweet spot in the consumer VR HMD market as yet unmined, to prove a success. 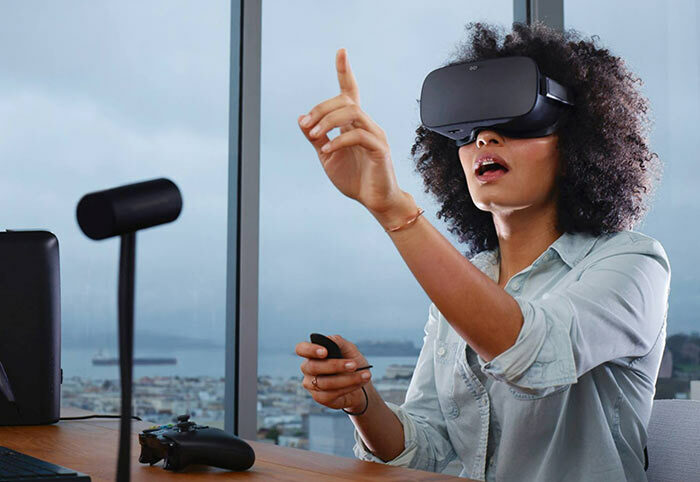 Codenamed 'Pacific', the new Oculus headset is said by the sources to be more compact than the Rift and lighter than Samsung’s Gear VR headset. For processing this headset will rely on a Qualcomm Snapdragon SoC. Its 'gaming power' is said to be a step above the Gear VR units. Xiaomi and its contract manufacturers are said to be producing the devices for Facebook. The device will create a "completely new category," especially with its pricing set as little as $200, reckons Bloomberg. However, I note that pre-launch talk of the original Oculus Rift often mentioned how accessibly it would be pitched, for market penetration. 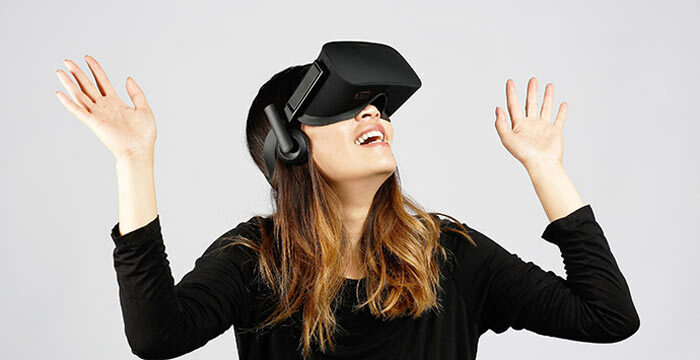 In a statement emailed to Bloomberg, Oculus spokesman Alan Cooper said "We don't have a product to unveil at this time, however we can confirm we're making several significant technology investments in the standalone VR category." Meanwhile competitors are advancing, with HTC and Lenovo believed to be making standalone headsets based upon Google Daydream and Samsung making an Oculus-based HMD. Facebook isn't expected to be pushing out developer units of its new HMD until October, so it is thought that the 'Pacific' product launch will miss the holiday season and be let loose in 2018. For those who are enjoying the PC-based Rift and would like to see it developed further there is news of a wireless version codenamed 'Santa Cruz'. Wake me when it looks like google glass. As long as it is basically strapping on scuba masks, I'm out. I would get tired of wearing that in about an hour and never touch it again. What you're talking about is AR (Augmented) rather than VR (Virtual), though there are applications where the line blurs, lije Augmented virtuality. Google Glass ‘augments’ reality with digital HUD-tupe overlays. VR is more immersive than that, and rither for entertainment or some serious real-world purposes, seeks to replace the real-world with a virtual world. The human brain integrates all sorts of sensory input and if you want to really convince it it's in a virtual environment, you need to be as immersive as possible, and that certainly means removing real-world sensory datastreams … especially periphefal vision. And for that matter, replacing real world sound with virtual world sound. If you can add other things, like vibration, and/or head and hand tracking, you can notch it up until you have a higjly convincing world to present to the brain. The whole point of VR is to make it as convincing as possible. To be thorough, you'd need full body suits capable of simulating pressure, temperature, etc. Bear in mind this is not just about games, but about realistic-as-possible training for situations hard to do in the real world, like pilot training gor crash situations, to deep-sea diving emergencies, fire service training or simulating astronauts having to do delicate servicing jobs on a spacewalk. Anyway, VR has to be snorkel-mask type headsets because as well as presenting the digital virtual data, it has to remove the real-world data, or it'd be AR not VR. Oh, and try flying an FPV drone, whether it's just flying around looking at things from perspectives you can't hope to see any other way, or racing them. Because in an immersive headset, you see what, and only what, the camera on the drone sees, it feels rather like you're in it. Personally, that's a feeling I never tire of, never mind in an hour. I'm talking gaming (don't think this is a medical/pilot site…LOL). I have no use for that thing on my head for hours gaming. As far as stuff like medical, pilots etc, sure bring on the possibilities. But again for gaming? I think it's already dead (as in like the day it launched), as there are not enough of us willing to part with $200-300 for VERY few experiences and it will likely be upgraded constantly for a while due to major advancements per model (power and perf per die shrink, etc). Also now that devs see how well the units sell (like crap, along with their games in VR), overall most will decide the first try was enough. Most want re-look at this until there are 10mil+ of these things out there in the market (of one type, so there isn't a bunch of effort to port to all the other players (no leaders really yet). That could take a while. A suit for this? ROFL. Not in my lifetime. The day I have to actually DRESS for my game, is the day I stop gaming…LOL. You can build glasses that block out side light etc (I own a pair, leather on the sides blocks incoming crap). Feel free to call the version I want a glass-enhanced model :) Just a few mods to make it more VR than AR ;) I'd rather buy a vid card or new cpu for $200-400. Color me unimpressed by the gaming side of VR. At some point maybe the gear will reach the point where I'd actually want one, but that's 5-10yrs away at best for me and even then I'd probably just buy a gpu/cpu or something else I actually NEED. For instance, I'm really looking forward to buying an AI car, ~2020. I'm talking gaming (don't think this is a medical/pilot site…LOL). No, its a technology site, and VR/AR is an upcoming technology that has many uses - including remote control, which includes remote piloting, tele-0medicine, training/simulation (which also includes ‘gaming’) and so any discussion that discusses the uses of VR/AR in these fields is valid - and the fact that prices are falling is going to increase development and adoption in these fields.